* Mid-summer: wire green shoots, but don’t prune back. * Winter: when flower buds fatten, you can shorten those shoots back to a profile that looks good when flowering. 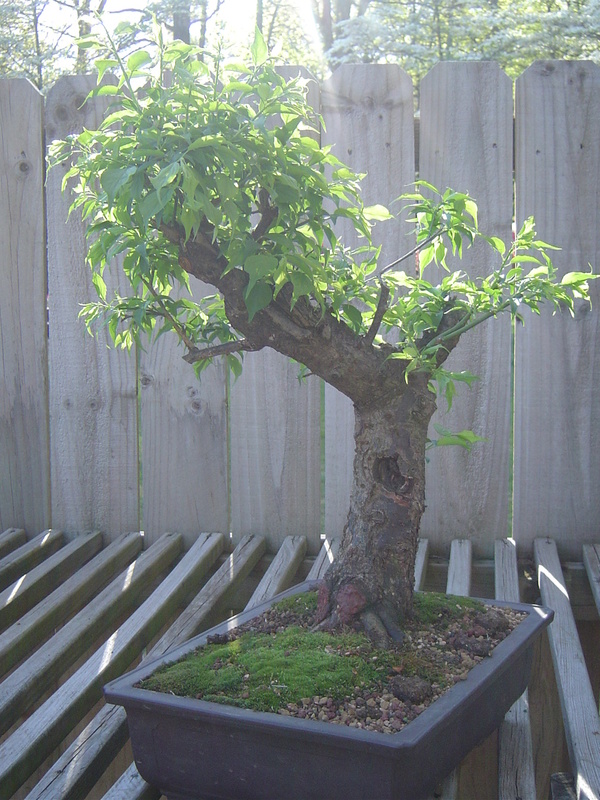 * Late winter/spring: after flowering, prune it back hard, to 1-2 nodes and repot. * Late spring: pinch back a little, but not later or you’ll risk flowering in the winter. * Smooth, glossy leaves have flower buds at their bases. Those that are a little rougher in texture will not flower, they look/feel different. Flowering-leaves also curl up in the fall. * It’s ok to let downward-growing shoots grow down, then bolt back up. 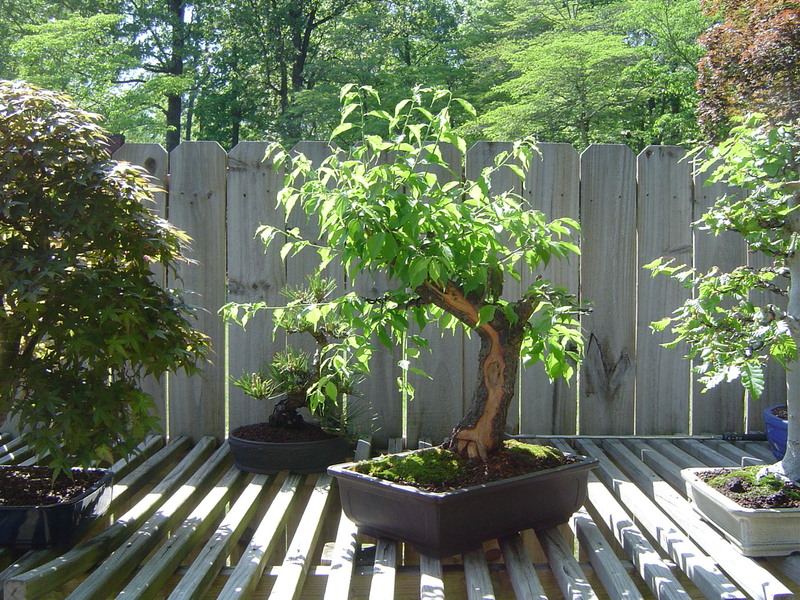 * You can actually “snap” branches when wiring, and as long as they’re partly attached, they will live and look very natural. 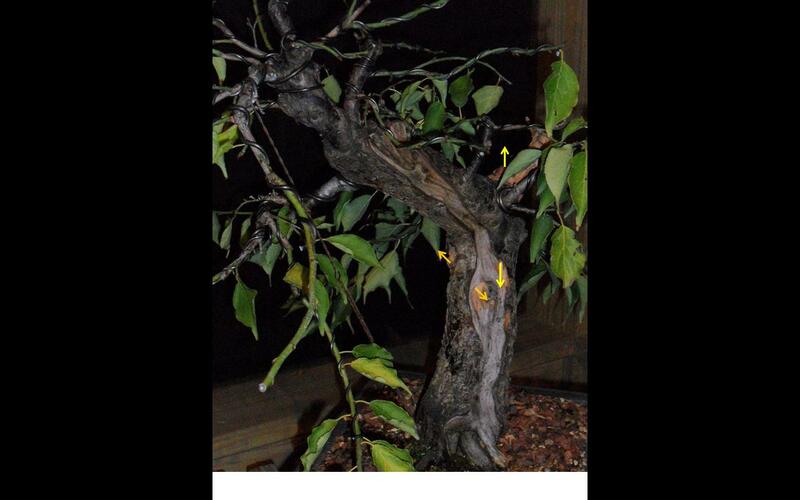 * Use guy-wires on heavier branches so they don’t break off at their bases. 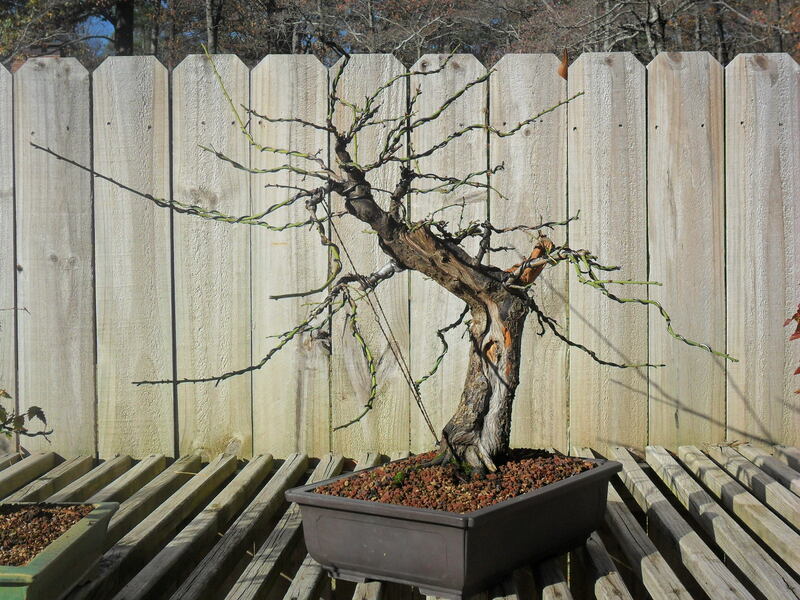 * Deadwood on ume looks great (they both said this) and will persist for many years. During the workshop, This front was selected, and I added a strike of Shari. 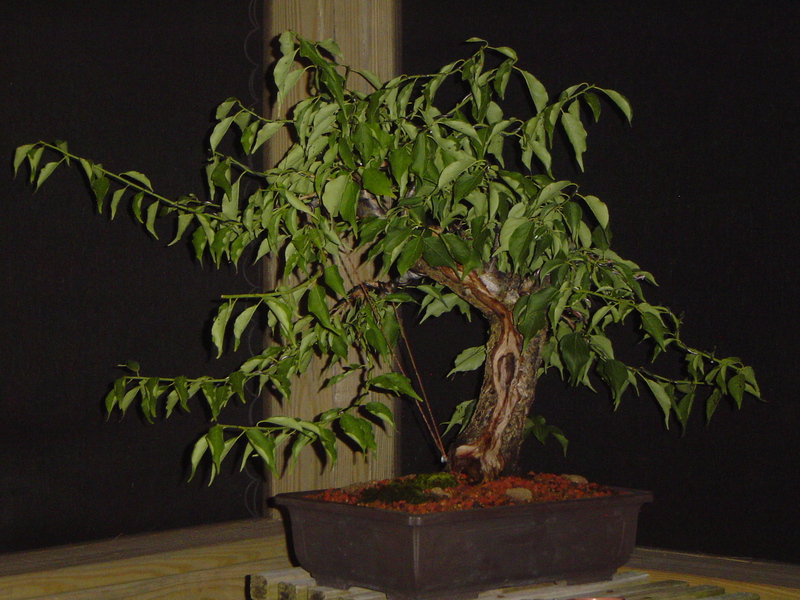 Ume are often displayed with dead wood, it is very dense and it persists for many years. Interestingly, the shari was placed in an area with smooth, immature bark, leaving only the rougher, more mature bark. 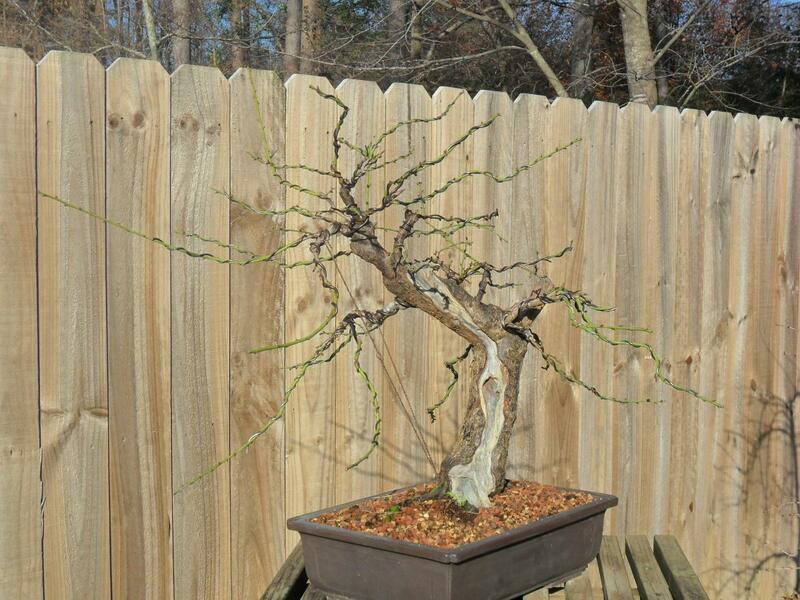 The next step will be to wire the branches down in June, especially the two left-most branches using Guy Wires. Later, carve out the shari and the jin on the outside of the trunk bend; it is no longer living. Here is a shot after mid-summer wiring, and a “virt” showing a better profile by removing some of the long canes. This fall, the jin was carved further, and a hollow was added which connected to the shari, and the scar on the left side of the trunk was also connected to the shari. It’s difficult to see in the photos, arrows indicate the holes. Presently the branches are very long and as blooms open, they will be shortened to show well in bloom. 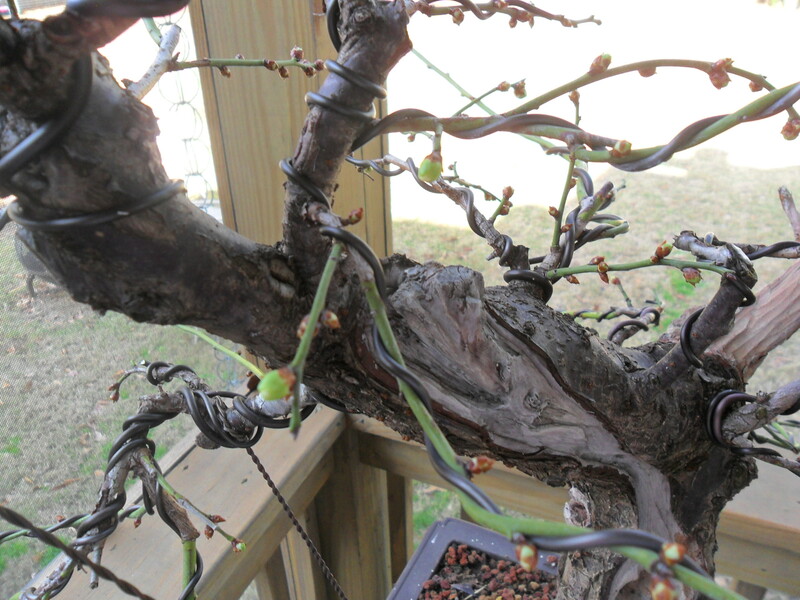 After blooming, it will be pruned back hard and repotted to orient to the proper front. 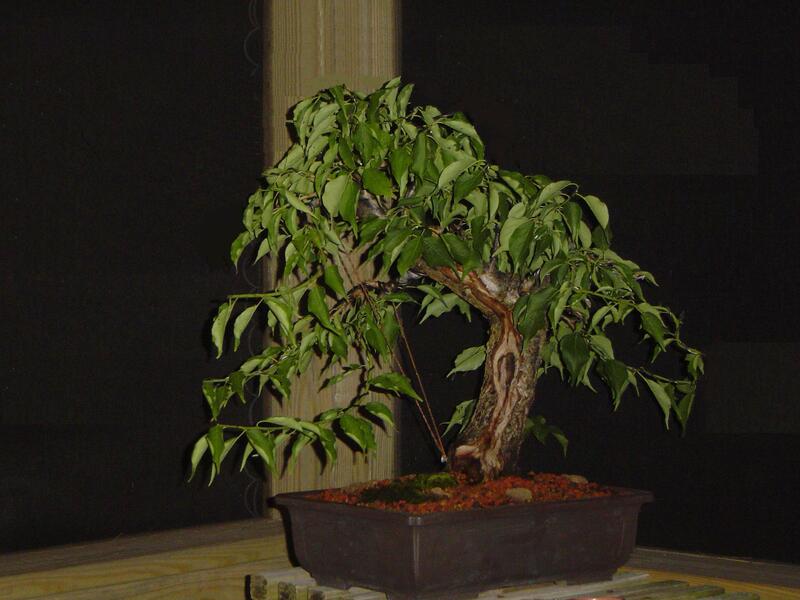 This is a current photo, after cleaning the deadwood, and painting it with lime-sulfur. I mixed 3 different cups, all diluted 1:1 water and lime sulfur, but with varying amounts of black India ink. Recessed areas were painted with the darkest mix, highest areas were painted with the lightest mix. The overall effect is pretty natural. More as it blooms! Thanks for reading; and Happy New Year!